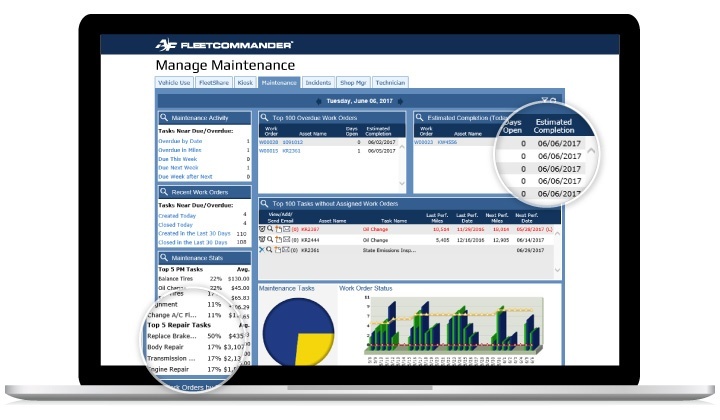 Managing your fleet maintenance is a snap with FleetCommander’s enhanced Maintenance module. Check out our new features and functions! The dashboard provides real-time status and easy ways to launch maintenance activities. Let the system mine your maintenance data for you. Need to create a work order? Just click. Need to know more? Click on nearly any piece of data on the maintenance dashboard and FleetCommander will drill down and provide you with more information about PM tasks, repairs, parts, labor, and other maintenance information. And, it’s all web-based and accessed online. Maintenance reminders can be sent to a variety of people, including the owner of the vehicle, the responsible person, and even the driver that is currently assigned to a vehicle. Reports. 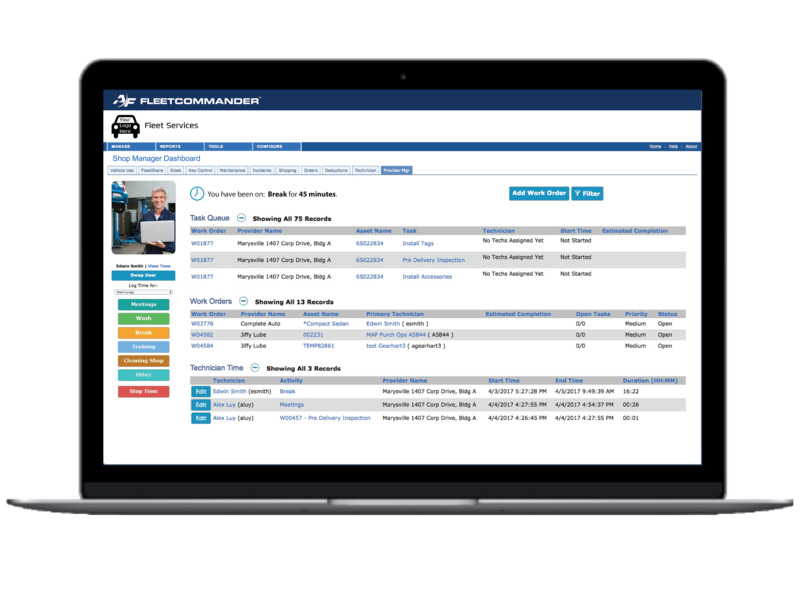 Get to the root of your fleet maintenance challenges with FleetCommander reports. View activities and costs in easy-to-understand reports. View work priorities and current tasks all in one convenient dashboard. The new FleetCommander Technician dashboard is a convenient, easy-to-use tool for technicians to see their tasks. On shared workstations, it's easy to switch to another technician by clicking the Swap User button. A photo clearly identifies the technician currently logged in. Easily log direct and indirect time, initiate time on work orders with quick-launch functionality. Also track PM tasks, repairs, parts, labor and other maintenance information -- all in one place. Work orders and tasks can be prioritized for efficient sorting. Plus, button labels and colors are all configurable to best meet the unique needs of your work environment. Track work orders, technician time, & more! Shop Managers have total visibility over all shop activities. Assign technicians to work orders and prioritize them. Track PM tasks, repairs, parts, labor and other maintenance information, all in one place. Track direct and indirect technician time and productivity with technician time summary and detail reports. Easily see task and work order queues and track work order workflow with our enhanced work order status options, including open, working, on hold, ready for review, and closed. You can keep track of parts within the FleetCommander Maintenance module. 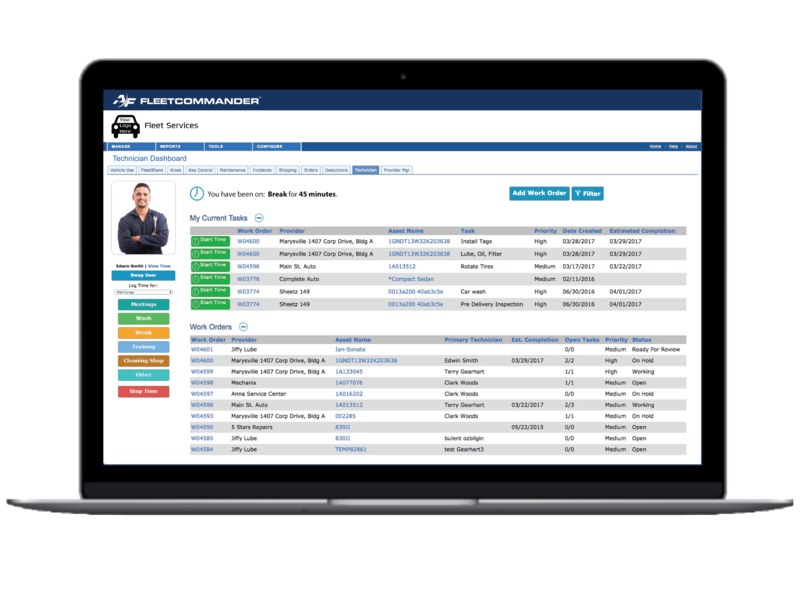 FleetCommander's parts management functionality allows administrators to track and control all inventory, including inventory levels and minimum and maximum points. Inventory can be tracked across multiple vehicle sites, stockrooms, and vendors and levels are adjusted as work orders consume parts. You’ll know when to order parts and how many to order.